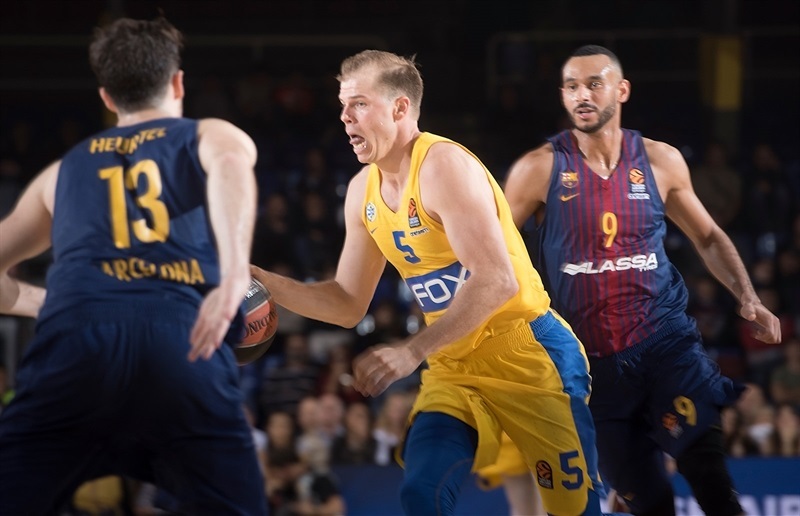 In a very special night for the club, FC Barcelona Lassa thrashed Maccabi FOX Tel Aviv 89-67 at Palau Blaugrana on Thursday. 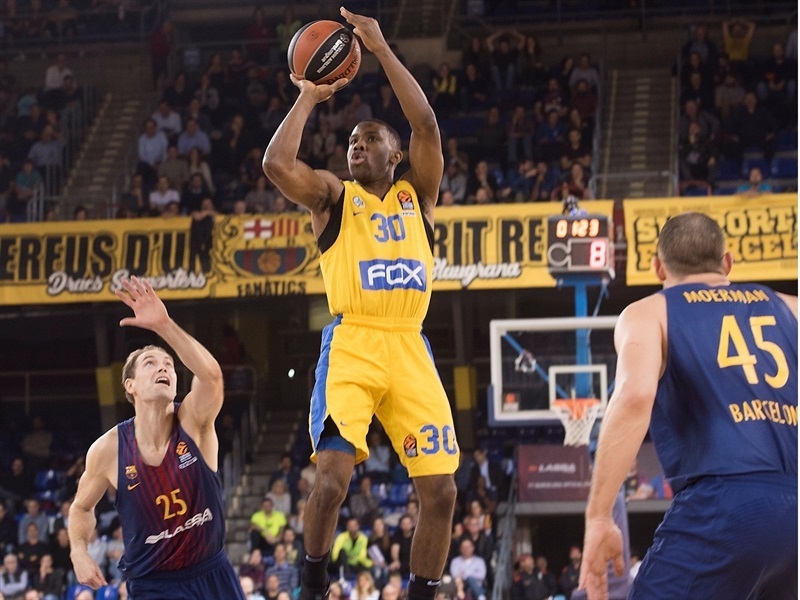 Barcelona improved to 4-5 in the regular season standings, while Maccabi dropped to 5-4. 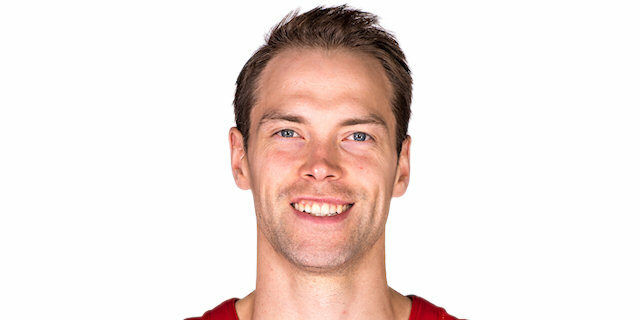 Petteri Koponen led the winners with 20 points and Rakim Sanders added 18 for Barcelona. Those players combined for 10-of-13 three-point shooting. 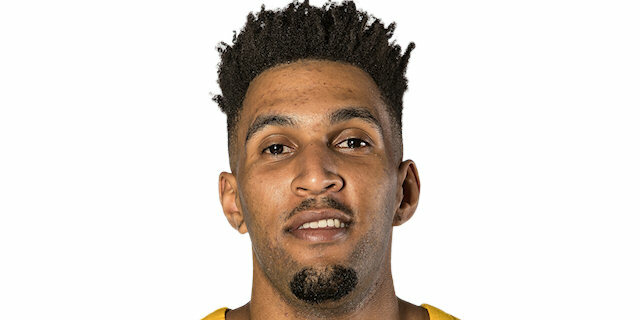 DeAndre Kane led Maccabi with 13 points and Jonah Bolden added 10 for the guests. 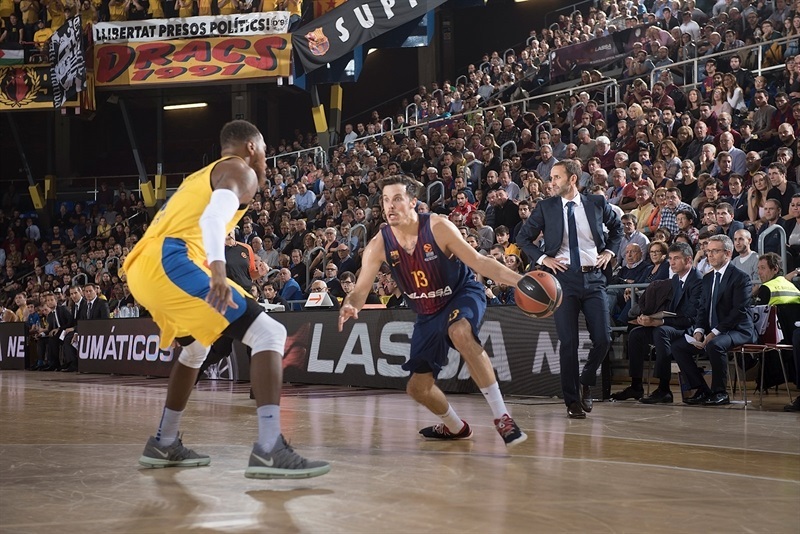 Great defense, three-pointers by Sanders, Adrien Moerman and Victor Claver, as well as an unstoppable Kevin Seraphin helped Barcelona to an 11-point lead after 10 minutes. Phil Pressey and Koponen joined the three-point shootout to boost Barcelona's lead to 34-15 midway through the second quarter. 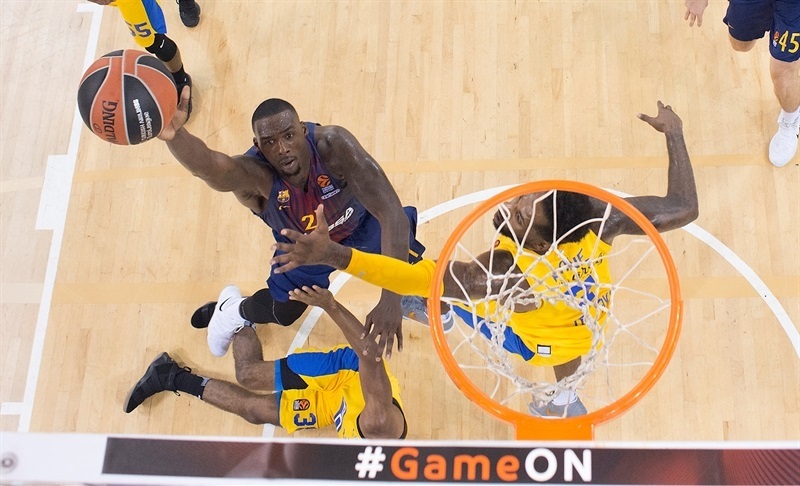 The margin stood at 44-24 at halftime and little changed after the break as Barcelona cruised to a big win. 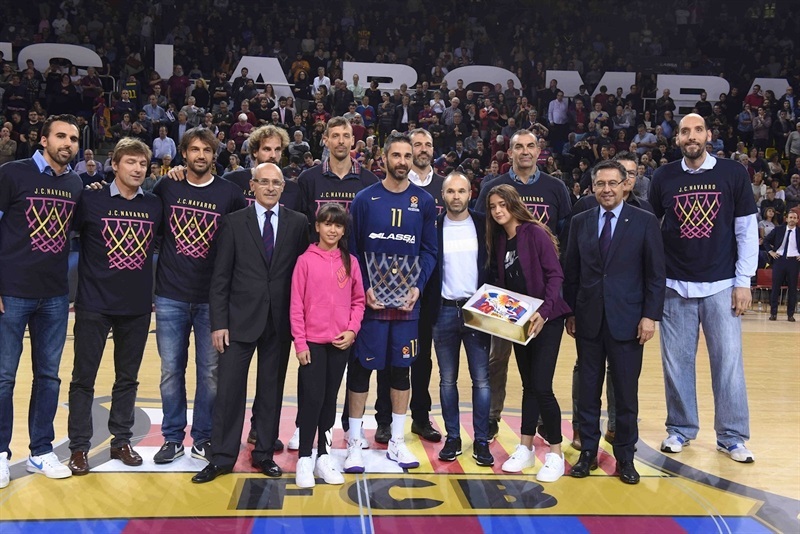 EuroLeague scoring king Juan Carlos Navarro was honored in a pre-game ceremony that celebrated 20 years to the day he made his first team debut with the club. 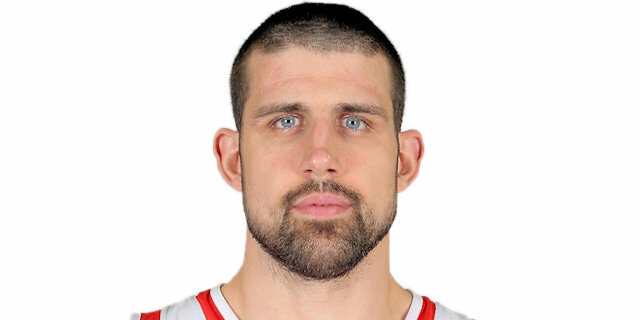 John DiBartolomeo got Maccabi going with a floater, but those were the visitors' only points in almost five minutes. 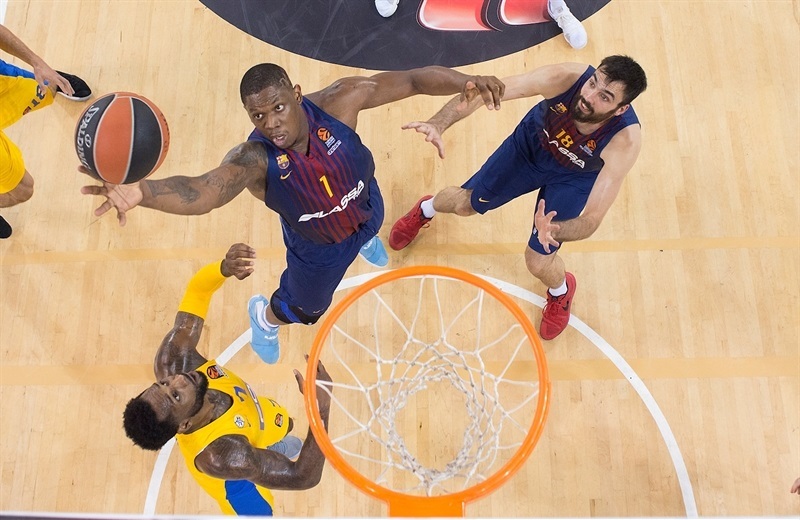 Seraphin had a layup, a jumper and a dunk in traffic in a 9-0 run that put Barcelona in charge, 9-2. Bolden followed a three-pointer with a dunk, but Sanders struck from downtown and back-to-back layups by Pierre Oriola and Thomas Heurtel boosted the hosts' lead to 16-7. Kane and DeShaun Thomas scored around the basket, but Moerman and Claver each hit from beyond the arc to make it a double-digit game, 22-11, after 10 minutes. 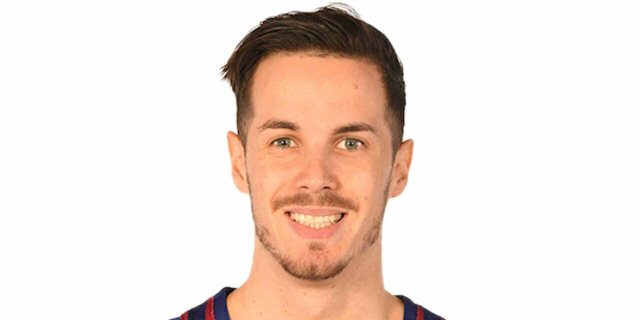 Pressey joined the three-point shootout early in the second quarter and got help from Ante Tomic and Moerman for a 29-13 Barcelona lead. Thomas dunked, but Koponen followed a layup with a triple to break the game open at 34-15. 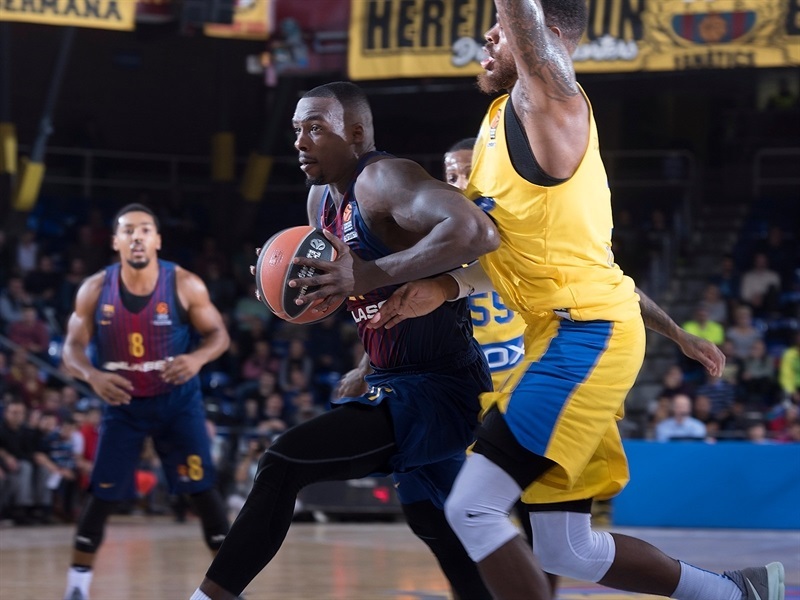 Maccabi kept struggling to score while Tomic, Sanders and Oriola boosted Barcelona's margin to 42-18. Kane and Itay Segev brought Maccabi a bit closer, 44-24, at halftime. 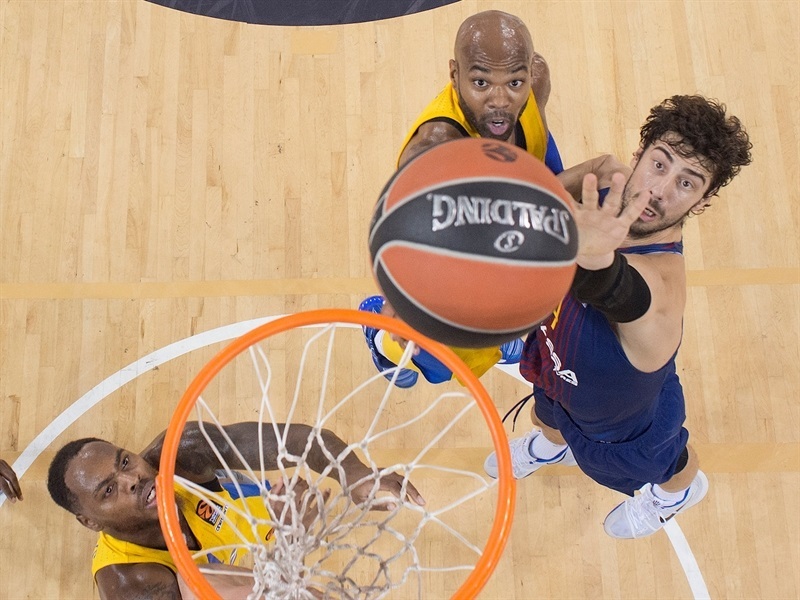 Seraphin dunked soon after the break and Sanders hit another triple for a 25-point Barcelona lead. 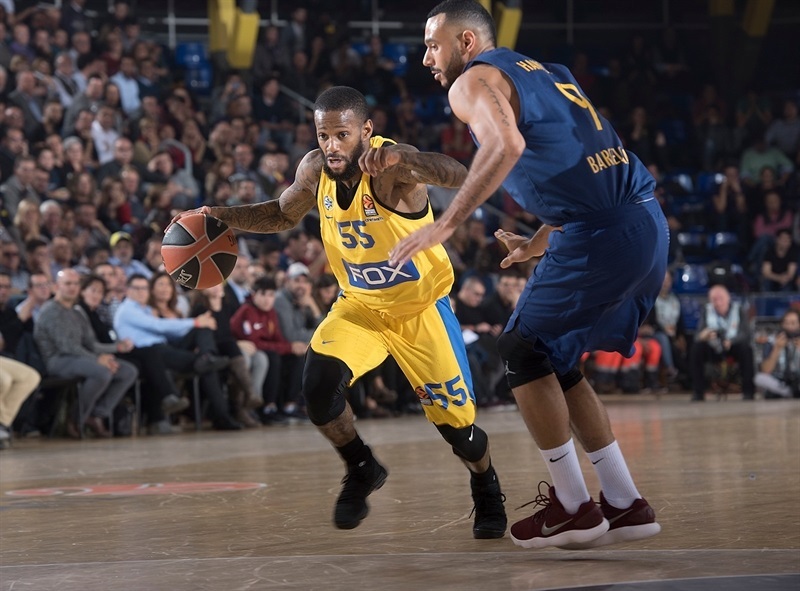 DiBartolomeo stepped up with back-to-back three-pointers, Pierre Jackson scored down low and a tip-in by Kane gave Maccabi hope at 55-36. 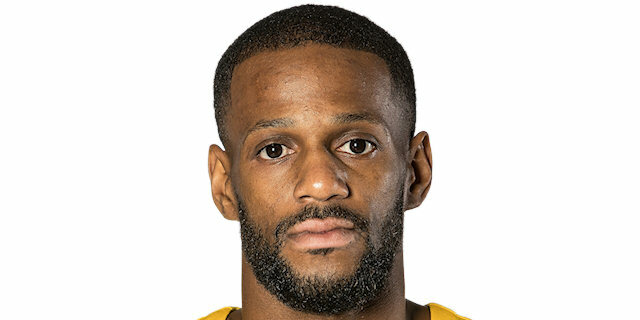 Alex Tyus and Norris Cole found their first points, but so did Adam Hanga for a 59-40 score. 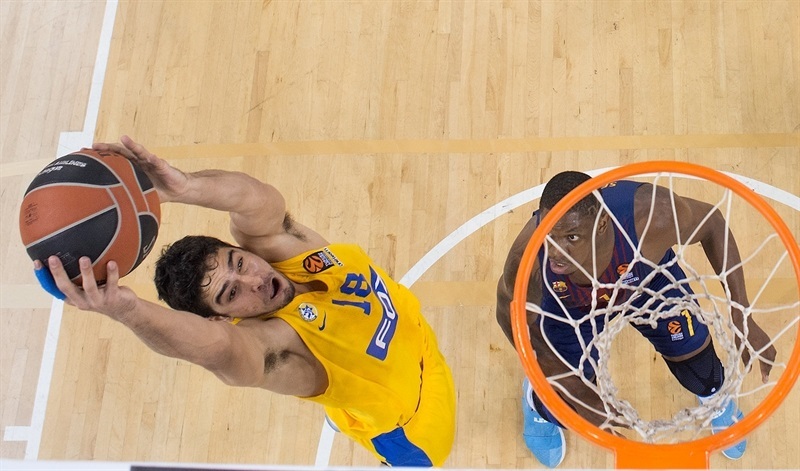 Tomic hit a jump hook and Koponen struck from downtown for a 66-44 Barcelona margin after 30 minutes. Koponen took over with a triple and a jumper that made it 73-46 early in the fourth quarter. 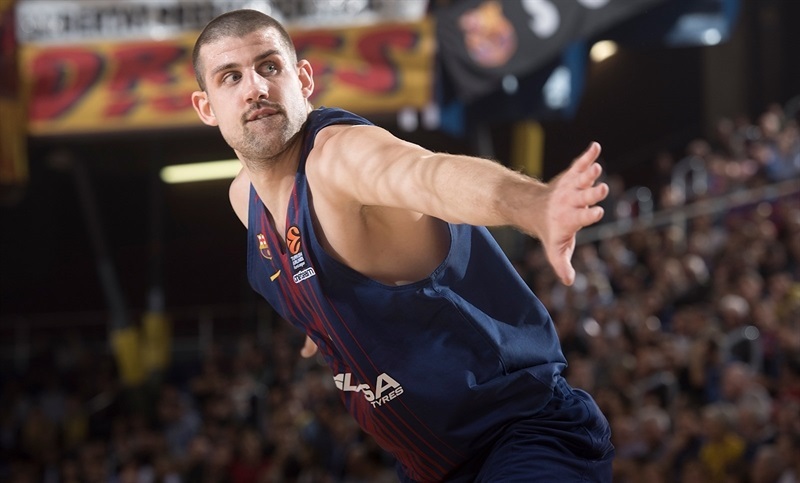 Palau Blaugrana started to sing Navarro's name until he finally stepped on court to a standing ovation. 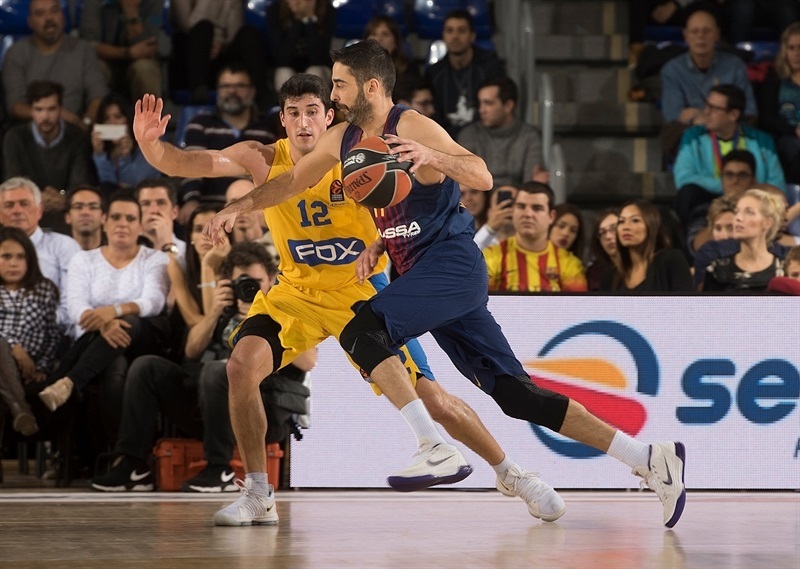 By the time Hanga buried a couple of three-pointers, Barcelona led 84-55 and all of its fans were celebrating a well-deserved win. 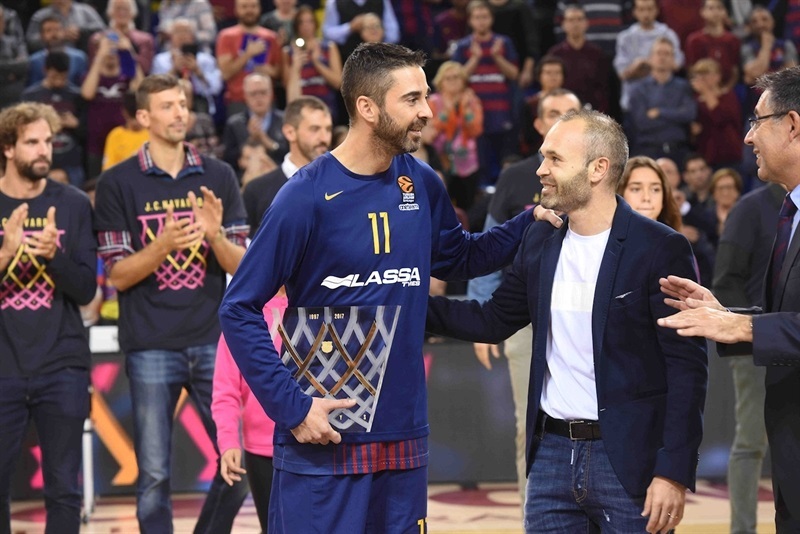 "Congratulations to the players, the fans and especially to Juan Carlos [Navarro] for being an example for everybody, especially in Barcelona's club atmosphere. We had a good game against a tough opponent that was playing very well. We were tough at the beginning of the game, which is what Maccabi does in all games, and that conditioned the game. We moved the ball well, ran and the squad had fun playing as a team. It is the most all-around game the team has had in the EuroLeague or the Spanish League. When a player like Juan Carlos is honored, it is always well-deserved. I always say it is impossible to see a player starting in the youth teams and playing so many years in such a high-level club. When you are honored, you expect everything to go well and this is what happened. Everybody is happy, Juan Carlos and everyone around him. We all wanted to be happy around Juan Carlos. The team will now stop for two days, which is chance for players to catch their breath before the road games against CSKA Moscow and Zaragoza. It will be very positive. We were the toughest team tonight and if Maccabi had its usual level of activity without us fighting back, we wouldn't have won. This is a good team, talented, incredibly physical which had a good start of the competition. Without that level of activity, we wouldn't have competed." "First of all, congratulations to Barcelona for the amazing basketball they played and for the win tonight, well-deserved. We didn't play good basketball and missed almost all shots in the first half, even free throws, and if you want to win at this level, you have to make some of them, take shots with confidence. We put a good effort in the second half, but the game was finished in the first half. This is not the way we want to play and the biggest problem for me tonight was 5 fouls made in the first half. That is not the way we want to play basketball. This team can win and lose, but we want to play with all of our effort, dignity and fight for the position in the team, to be a team. We didn't lose like as a team and that is my biggest problem, bigger than the 22-point difference." "We had prepared the game really well, more or less as always, and everyone was focused from the very beginning. We played very well and were better than them from the beginning. We hit a lot of open shots and they didn't. We rebounded well at both ends and in the end, we beat a team like Maccabi which was in a good moment. We are now also in a good moment and I hope we can carry on that way. We were very focused on defense, very aggressive. I am very happy for this win. We must rest now and prepare for the big game against CSKA next week." "We started the game well and played excellent defense. That was the key in the first half. We knew we had a couple of games in which we were leading by 15-20 points and let our opponents come back. After halftime, everybody was talking about staying focused and to keep playing well, and that is what we did. We stayed focused for 40 minutes and didn't give Maccabi a chance to win tonight. In Milan, we were up by 15 points and let them come back and win the game and everyone knows what happened against Bamberg. We stayed focused, kept controlling the game and doing the same stuff in the second half." 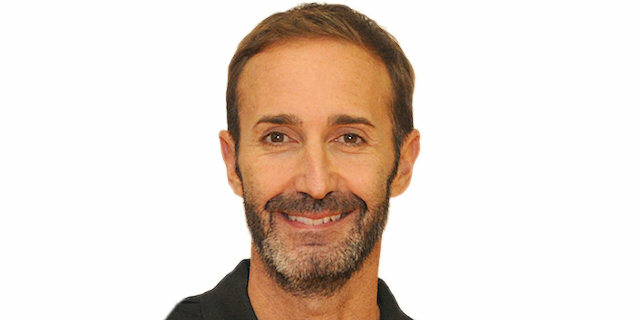 "We had a strong start of the game, very aggressive, and put Maccabi behind us all game long. It was a good win because everybody played well and we enjoyed this game. We don't want to make the same mistakes as in Bamberg, when we led by 28 and lost the game in the end. Everybody enjoyed, also the fans, and that is great. We have a lot of new players and need to understand each other to play better. We won our last three games and need to keep going, keep working hard like we did to keep getting better." "Our focus at halftime was to come out better. Coach talked about how we only had 5 fouls in the first half and that kind of the emphasis in the second half. We didn't deliver. They are a good team and got the best of us tonight. We always bounce back. We are a great team, we will come together, re-evaluate, watch video and on to the next one." 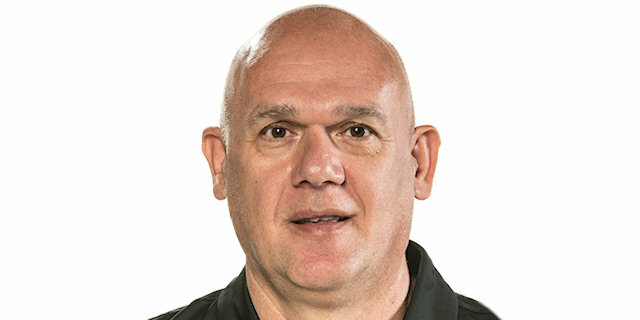 "They played really well in the first half and we trailed the whole game. They made shots and we didn't. This is basketball; they had a game previously in which they were up by almost 30 and they lost. They were the better team tonight. This is our first year together and we have been playing well - obviously, you have a game like tonight, but I can say it is a long season."